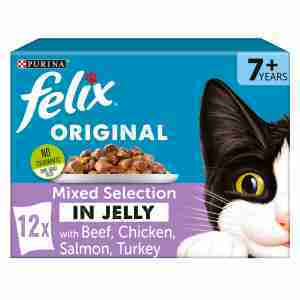 Delicious Felix recipes are a complete pet food for adult cats (remember we have special ones for the little Felix cat and the golden oldies). And rich in variety too! Living the rich life is supposed to be easy but with so many truly tempting flavours to choose from it's enough to get your tail in a tangle. With a scrumptious selection that includes yummy beef, delicious chicken and tantalising tuna, to name but a few, you can see the dilemma! Felix Kitten food is packed full of all the protein and nutrients that little Felix cats need to grow into big Felix cats. Perfect fuel for the first years adventures! ... to a satisfied senior. With Felix they're not called the golden years for nothing. Felix Senior looks after those going a bit grey around the whiskers with their very own specially formulated, super tasty recipes. With Rabbit: Meat and animal derivatives (of which rabbit 4%), fish and fish derivatives, minerals, various sugars. Meat and animal derivatives, fish and fish derivatives (of which tuna 4%), minerals, various sugars. Meat and animal derivatives, fish and fish derivatives (of which trout 4%), minerals, various sugars. Felix cat food is a complete (completely deeeelicious!) pet food for adult cats. For an average adult cat (3. 5kg) feed approximately 3 pouches per day (which 3 will it be today? ), preferably in 2 separate meals. For pregnant or nursing cats, feed as much as your cat will eat. Food should be served at room temperature (then your cat can really enjoy the yummy smell of Felix too - bring it on!). Fresh, clean water should always be available.